The walls of De Cakery are adorned with post it testimonials about how good the cakes at this bakery are. Make a quick stop and take home a box of goodies or spend a few hours here over tea, coffee and a long chat because that’s what cosy bakeries make you want to do. 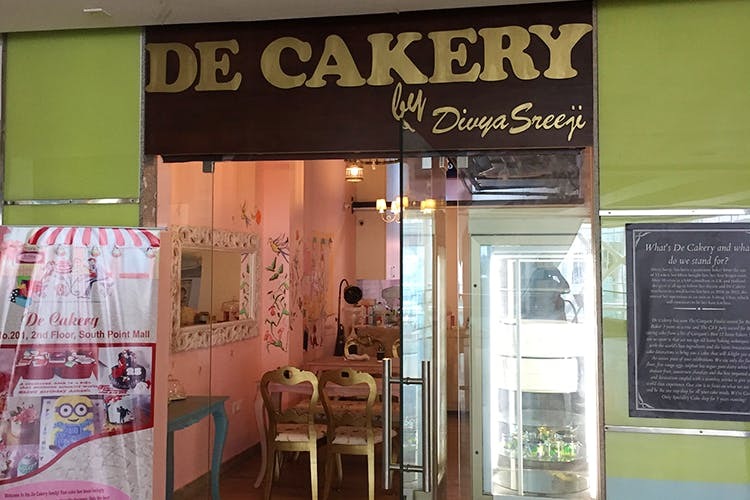 De Cakery is Divya Sreeji’s dream come true – after years of baking stellar cakes from home, she’s finally opened an outlet that allows you to try her stuff without having to order in advance. Over the years she has done some of the city’s finest fondant and theme cakes, but De Cakery’s menu also includes mini sandwiches and quiches to go with your beverage of choice. Both the chicken and mushroom quiches make for an excellent snack over a conversation or a meeting. The star at De Cakery is the assortment of daily bakes which change from day to day since it’s all baked fresh. There’s a good chance you will find muffins, cupcakes, cookies and more on any given day, but it’s their chocolate cake that’s a regular feature and for good reason. Served with a scoop of the ‘Ice Cream of the Day’, we’d happily gobble this up any day of the year. Drop in for a new surprise every day or you could call in and ask about the daily specials. You can also order customized fondant and non-fondant cakes for your next special occasion from De Cakery.